Lunch is the perfect venue to catch up with good old friends, except that you might feel you can't linger too long and forget about having to go back to the office; which was certainly the case today. 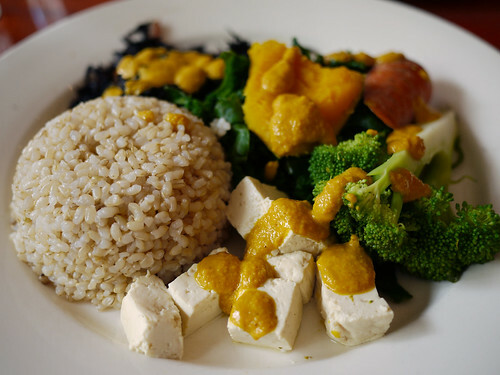 With some dietary restrictions to consider we settled on Souen - a macrobiotic restaurant that's a NYC fixture in the city's health food offerings. We both got the Macro plate (he with an added side of grilled salmon) and we were both super satisfied. While it would drive me nuts to eat so "healthy" at every meal, I sincerely enjoy meals like this too. For me, it's all about variety; there's a place for almost everything in my discerning but undiscriminating belly. Plus we got a good Harvey Keitel sighting!